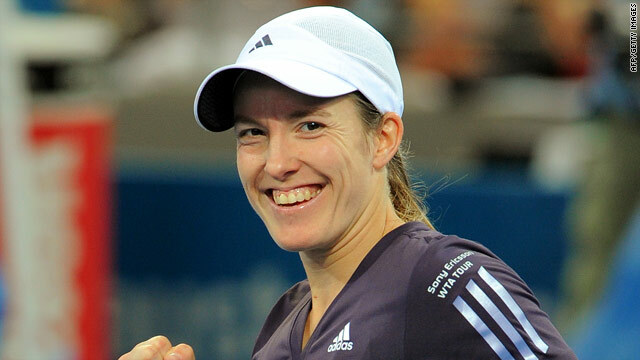 Justine Henin is all smiles after winning her comeback match at the Adelaide International tournament. (CNN) -- Justine Henin and Richard Gasquet have both made winning comebacks at the Brisbane International tournament. Former world number one Henin, playing her first tournament in over a year-and-a-half after retiring in May 2008, beat second seed Nadia Petrova 7-5 7-5 in one hour and 37 minutes. She will now play Kazakhstan's Sesil Karatantcheva, who won a topsy-turvy encounter against home favorite Casey Dellacqua 6-2 0-6 7-6. Gasquet was also impressive on his return, beating Finland's Jarkko Nieminen 6-3 4-6 6-4. Frenchman Gasquet is hoping to return to the top 10 following a controversial 2009 in which the Court of Arbitration for Sport finally cleared him of wrongdoing after he failed a drugs test in March. Gasquet insisted he inadvertently took cocaine after kissing a woman in a Miami nightclub -- a claim backed by CAS despite the International Tennis Federation (ITF) and World Anti-Doping Agency (WADA) demanding the player be banned. It was good to play with nothing in my head. It was important I could play relaxed. After his match, the Frenchman told reporters: "It was good to play with nothing in my head. It was important I could play relaxed." Elsewhere in the men's draw, seventh seed Jeremy Chardy went out at the first-round stage, beaten 6-4 6-4 by Colombia's Alejandro Falla. Chardy's fellow-Frenchmen Arnaud Clement and Michael Llodra also lost, to Wayne Odesnik and Harel Levy respectively, but Marc Gicquel did go through thanks to a 6-3 6-1 thrashing of Philipp Petzschner. Meanwhile, top seed Andy Roddick and second seed Radek Stepanek both went through with straight sets victories. Ana Ivanovic enjoyed an impressive win as she looks to get her career back on track following a disappointing year. The third-seeded Serbian, another former world number one, beat Jelena Dokic 7-5 1-6 6-3 but fifth seed Alisa Kleybanova lost 6-4 2-6 6-2 to fellow-Russian Anastasia Pavlyuchenkova. In other tennis news, second seed Marin Cilic and fourth seed Janko Tipsarevic both reached the second round of the Chennai Open in India, while top seed Flavia Pennetta and third seed Yanina Wickmayer are through to the second round of the Auckland WTA event in New Zealand.